I’m running out of places where I can dumb. Photo courtesy of Glenn Havinoviski. 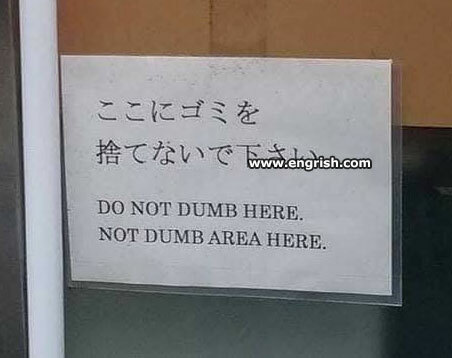 Found in Japan (meant to say “do not dump here”). Can we play bridge here? I bid one no Trump. If you do, we will thumb you! Harry and Lloyd, you better just keep walking. So no area for Donald. I’m fairly dumb – where do I put my garbage then? Is this located at Dumbleton? From a tarped and tinny tip-truck, full of stinky smelly scrap. DISPOSE OF ALL DROSS! All ye who enter here. Thus spake Zarathustra with a voice like thunder. Just use the no smorking area. You’ll have to watch “Dragnet”elsewhere. On no account screen “Dumb and Dumber” in this cinema. Those who didn’t hear that will get the deaf penalty. But I couldn’t see the sign. The lambs were too dim ! This sign is to be taken litterally. The area has just been re-tarred. @DnT 1923. How about littoral ly? @Marum | 9:13 pm: Shore, why not?